This week, I was asked to guest lecture for an intro design class at Trinity Western University. It was the first time I ever stand up in front of a class to tell them about me and my work. I taught this very class last year, but teaching a subject and talking about yourself are two very different things. I wanted to talk about more than just me and my work (which I would imagine, without context, could be a bore). So I figured I'd talk first about my thoughts process in general, and then about the process by which I became a designer and illustrator. It made talking about my work easier because there was a story to it. I could talk about it as a part of a larger story. The importance of story is that it becomes easier for others to relate. For anyone interested, I'm providing a more scripted version of the lecture in two or three parts. Here is the first instalment. Hello. My name is Tom Froese, and I am a designer and illustrator. I love what I do, and I appreciate the blessing it is to be able to work and earn a living in this exciting field. I love what I do, but it is not always fun. Design is hard work. The struggle to get from blank page to great idea to the final deliverable is a struggle. This struggle is called the process. If you don't like the process, you will not like design very much. Design is not for people who are impatient, who must have instant gratification. The irony is that most designers are just the opposite. We are designers because we crave the immediacy of the visual. We think we get to shortcut through the maze of abstraction and conceptualization to the concrete world of colour and form. The truth of the matter is that design is all process. 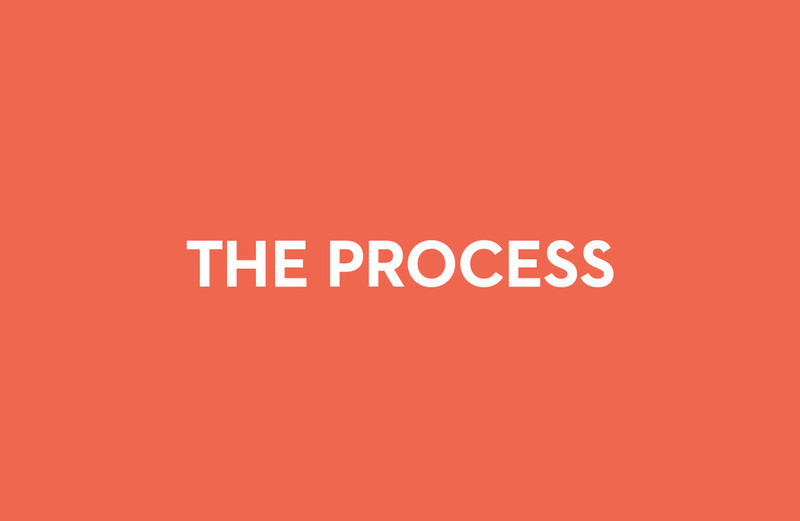 What is process? Process is a period of activity leading to discovery. It begins with a lot of questions, takes you through the agony and ecstasy of finding the answers to these questions, and then realizing that there are more questions, and this activity iterates, hopefully becoming more and more refined. The process is rewarded as the answers become crisper and more tangible, and this is when the process ends. At the end of the process, you are left with your so-called "deliverable". This is ultimately what the client asked of you and for which you are to be paid. The deliverable might be something like "Build me a website" or "Design me a logo". A good designer will start not with a clear vision of the website or logo, but only with questions. Design that has predetermined results is not design at all — it may be a form of styling or creating, but it is not design. 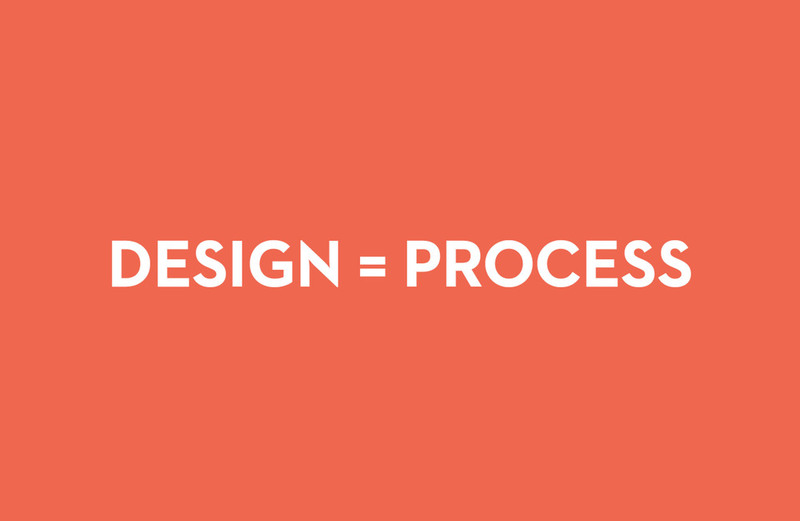 Design process is more like the scientific method in this regard. You have problem statements, hypotheses, predictions, observations, and those kinds of things. For instance, you might hypothesize that by the end of your project you will have a website or a logo. But if you are facing a new problem, although you have guesses at how it will be solved, you do not know for sure. It is in this not knowing where great stuff is to be found. Design is kind of like art and science combined, and it is in the intersection of these two where the magic happens. If design is art and science, I think it is also in large part faith. Not in the religious or spiritual sense. In order to endure the agony and ecstasy of the process, it is only your faith that it will ultimately end up somewhere useful and good that keeps you going. At 3AM the morning of an important deadline, it is faith, not science or art, neither skill nor prowess, that keeps you awake and forging ahead to the as-yet unrealized breakthrough. But experience, intuition and perhaps a lot of wishful thinking make you confident that you will succeed. 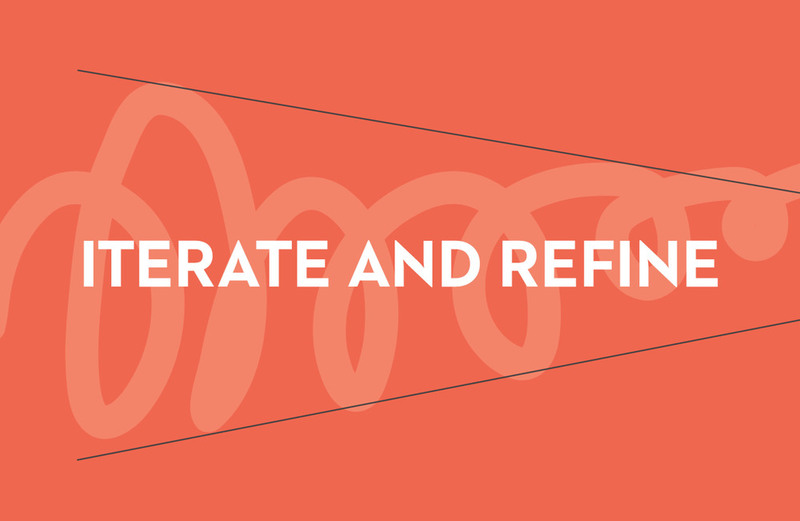 If design is not a process, then design is a formula. It is like science without art. Literally. As science means knowledge, design without process is working only with what you know. You approach all your problems in the same way, knowing how the work will end before you start it. A few times this might be interesting. Most times it will be boring. 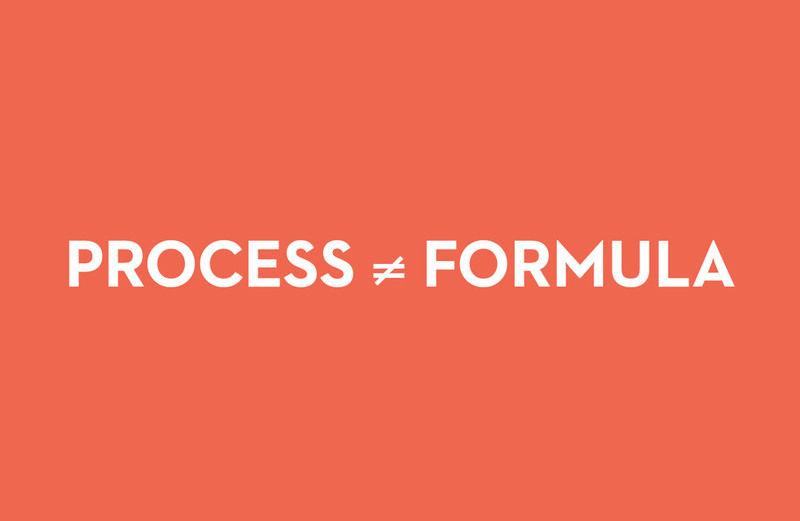 There is a difference between process and formula. The design process has methodology to it, but it does not lean on predictably repeatable conditions, and it does not hope for predictably repeatable results. 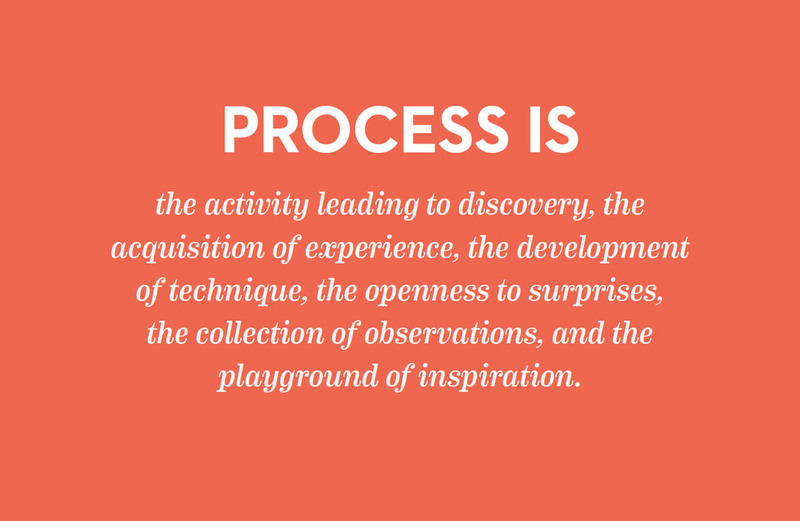 Process is the activity leading to discovery, the acquisition of experience, the development of technique, the collection of observations, the openness to surprise, and the playground of inspiration. If you have a lot of time and patience, if you want to create things that you didn't know you would or could; if you want to learn more than you set out to do; if you want to try things you never thought you would; if you want to surprise others — and yourself — embrace the process. Even be a designer.